I was writing in my handwritten journal the other day, as I am wont to do when I'm feeling overwhelmed and stressed but need a more tactile way of unburdening myself of the anxiety (while I could likely type for days without running out of things to say, there's nothing more cathartic than a pen scratching sheet after sheet of paper). Out of one of the pockets fell an envelope I'd tucked in there before I moved to California. 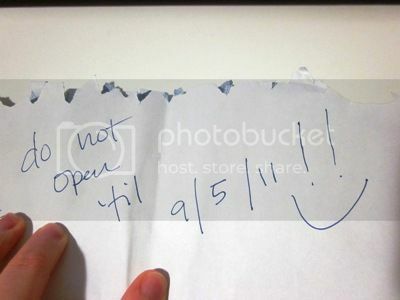 I didn't remember it at all, and since the deadline I'd apparently set for myself had more than passed, I tore it open. In August, I'd set a challenge for myself and Meghan to try and get out of our respective plateaus. Dying to see an 8 in the tens place, I set up rules for eating and working out, as well as activities to stay motivated and inspired. The first week, we had to write a letter to ourselves for after the challenge. First, and above all else, I am so incredibly proud of all the work you have done so far. Losing weight isn't easy - you know that. You've been trying for years. But finally, you became strong enough to stand up for yourself and fight for your health. You finally figured out that you're worth the sweat and the tears, that being lazy and eating exclusively junk food aren't "treats" but rather, punishments. You were sad and lonely and pretty hopeless, and now look at you! There are still tough days - there always will be - but you'll never be that big unhappy girl again - you value yourself, you understand your self-worth, and you'll never allow yourself to be mistreated or slighted again, especially not by your own self. You've been having a bit of a rough time lately, and that's okay. It's normal to have struggles in life, whether you're trying to lose weight or not. But I'm concerned, because you've been trying to self-medicate with food. It's okay to sad because of what's happening back in [hometown]. It's understandable to get upset because [Boy] was cheating on you. It's normal to be anxious about not having a full-time job and a secure career. But it's not okay to turn to food as a source of comfort or stress relief. What is happening at home is not your fault, nor is it within your control. Some people in life will hurt you and break your heart - again, not your fault. And jobs are hard to come by for everyone these days - there really isn't much more you could be doing. The solutions to these problems are not food. I wish you would lighten up a little. Stop taking everything so seriously and so personal. Do what you can about what you can do - everything else will work itself out one way or another. I know you're scared about weight maintenance. About feeling like you're living a secret double life. About how to find a healthy balance. About how to let food be food and not something good or bad or worth worrying about. You still have a bit of work to do before your goal, and I know you'll use this time to do your research, to explore possibilities, to figure out what maintenance entails for you and your own situation. There is nothing to fear - you'll do well, just as you've done in the losing phase, because you want to do well. You're doing this all for yourself, which is the one and only right reason to do this at all. You enjoy feeling healthy and being active, and for the first time in your life, you're genuinely in love with yourself. You're worth fighting for! 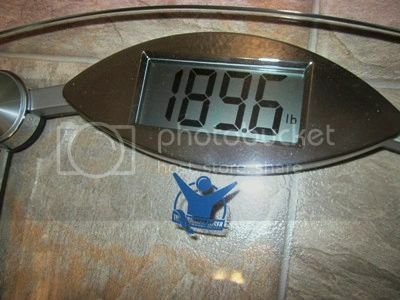 Enjoy the 180s while they last - enjoy the life, don't fixate on the scale. How wonderful to find it this week, exactly when I needed its message - especially its love and support. I've been weighing my options and thinking about a few different possibilities, and am trying to put together a few ideas for what to do next: to stay in California, to move back to Chicago, and how to live my best life possible no matter where I end up in the fall. There's an awful lot to consider, and I'll be fleshing it all out in a post some time soon. It's not an easy decision by any means, but neither are most of the really big decisions in life, I think. By the way, that letter to my in-the-180s self was dated "Aug. 7, 2011." My workouts this month were good - not great, but good. I walked a lot, which I don't track. According to my workout log, I ran 30.41 miles and biked 159.92. The biking was less frequent than previous months, and shorter rides (most under 20 miles). I ran most days, but did a lot of shorter runs (usually 1-3 miles). I ran the Shamrock Shuffle while I was in Chicago - I finished in 49:09, taking 1:26 off my last 8K time (and 8:09 off last year's time at the same race). I want to increase my numbers for April - both for workouts and weight loss. While it's true that I had a lot of work-related obligations in March that had to take precedence some days, I also had a lot of days when I chose to do nothing, or do less than I could have. To be completely honest, I'm really, really exasperated by all this. It's been two steps forward and one step back for eight months now. I feel like most days, I'm just treading water, desperately trying not to drown. I'm still breathing, but barely. I used to love sharing my accomplishments here. Lately, though, it's been a struggle. I've had a hard time seeing what I've done as "accomplishments." I run, I bike, I eat well - but not consistently. I hate giving excuses as much as people hate reading them, so I'm not about to sugar coat it. My lowest weight for the month was 190 - it lingered there for a few days, then worked its way back up. I'm grateful for being in the 150+ loss range still, but frustrated about starting another month in the 190s. I'm trying to focus on the fact that, small as it may be, it's movement in the right direction - but what frustrates me more than anything is my inconsistency. I used to lose three pounds in a week. Three in a month? That's the result of not making good choices consistently. I make great decisions for a few days at a time, then get overwhelmed by one thing or another and slip into old habits. I used to post here every single day. I loved the accountability, as well as sharing my stories and my successes. Now, it's much less frequent, mostly because I can't stand to hear myself complain (and I've received a few e-mails from people who tell me, for one reason or another, that I have no right to complain, that things are really so good for me right now). The truth is, this used to feel like a safe space for me to vent, and sometimes it doesn't, mainly when I get feedback like that. This blog is a glimpse into my life, raw and exposed. And I'm struggling. I'm depressed. I'm frustrated. I'm frustrated about being stuck in a small farm town in central California, and even more anxious thanks to the recently discovered fact that my job here might not be safe. I relocated for this job. I gave up so much to be here. And even though I am profoundly unhappy here, it's still a full-time job that pays well. So I'm also frustrated by not knowing what to think or feel. I'm frustrated about loving so many people who are thousands of miles away. When I first started living healthier, I recognized that "food doesn't love me back - food is not my friend, my friends are my friends." I lived by that. Here, though, I'm struggling without any close relationships, debilitated by the pain of missing my friends and family. I love visiting, but every trip hurts because I know it's temporary. I'm reminded of how wonderful it was to have local love and support, but it's fleeting, and the feeling of safety is taken away just as soon as it comes back. I'm frustrated by what feels like I'm failing at something I used to be fairly good at. I lost 150 pounds in a year, but I'm down only 3 pounds in the eight months since then. I've lost and gained the same ten pounds for months. I know the number on the scale isn't everything, but I'm also not terribly proud of my non-scale accomplishments. 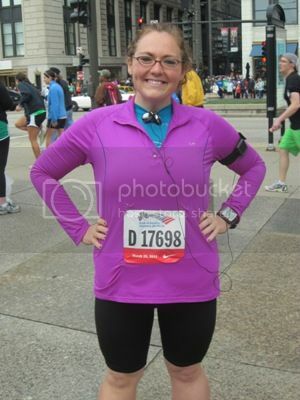 The half marathon, the race PRs ... I don't value them appropriately because all I can focus on is the fact that I'm all but entirely relapsed into an addiction I formerly had under control. It's illogical to deal with an inability to commit to eating well and exercising by overeating and being lazy. Yet I still self-medicate with food and naps. The thing about overeating, and I can't say this enough, is that it isn't about food for me. I keep trying to remind myself, I want to look and feel my best, and I want it more than I want to eat X. But it isn't really about *wanting* to eat X, Y, or Z. It's a compulsion. I get stressed, frustrated, overwhelmed, and this is how I hurt myself. Some people drink. Some people cut themselves. I eat until it hurts, cry, and take a nap. I always regret it, but in the moment, all I want is the high. I want to shut off the anxiety for a few minutes and lose myself in the good feeling of overeating, even though my logical brain knows it's all temporary and I'll end up feeling worse afterwards. Somewhat topical, given this week's events: when I was first starting to lose weight, I shared an article I read about an idea called "the lottery effect." People who lose weight, like people who play the lottery, tend to think that if only this one thing wasn't a problem anymore, that everything else would be fine as well. The only thing winning the lottery solves is having money in the bank; the only thing losing weight solves is having a smaller number on the scale. The problems and issues you had before are still there, needing attention. I've been really overwhelmed with problems and issues over the past eight months, mostly because I've tried to ignore them, hoping they'll fade away. Really, though, they've intensified. There's an incredible scream inside me, aching to be released. And I can't keep quiet for much longer. Right now, my top priority for April is getting my mental stuff in order. As always, I want to lose weight and all that, but above all else, I want to work through these emotional issues. Face my stuff instead of stuff my face, so they say. Reach out to the people who love me when I feel anxious - they understand, and they can help me through it much better than a binge will. Stay active, eat well, drink lots of water - and do it all consistently. What about you? How was your March? What are your goals for April? How do you work through the emotional side of weight loss?